Today instead of just one game I am looking at three different games: Rummy Royal, Tripoley, and Michigan Rummy. All three games owe their inspiration to Poch (1400s) and Pope Joan (1700s). The reason that I have combined these three games into one review is that outside of a couple small differences Rummy Royal, Tripoley and Michigan Rummy are the exact game. Despite regularly seeing all three of these board games at many thrift stores and rummage sales, I had never played any of them before. Not being a huge fan of traditional card games, I never really felt the need to try them out. I finally decided to check them out though to see why the games were so popular. While Rummy Royal, Tripoley, and Michigan Rummy are still popular to this day; I don’t exactly understand why as they are very basic card games that rely entirely on luck. Place the gameboard/play mat in the middle of the table. Equally distribute the chips to all of the players. At the beginning of the round players will “Play the Corners” if the players have decided to play the optional game. 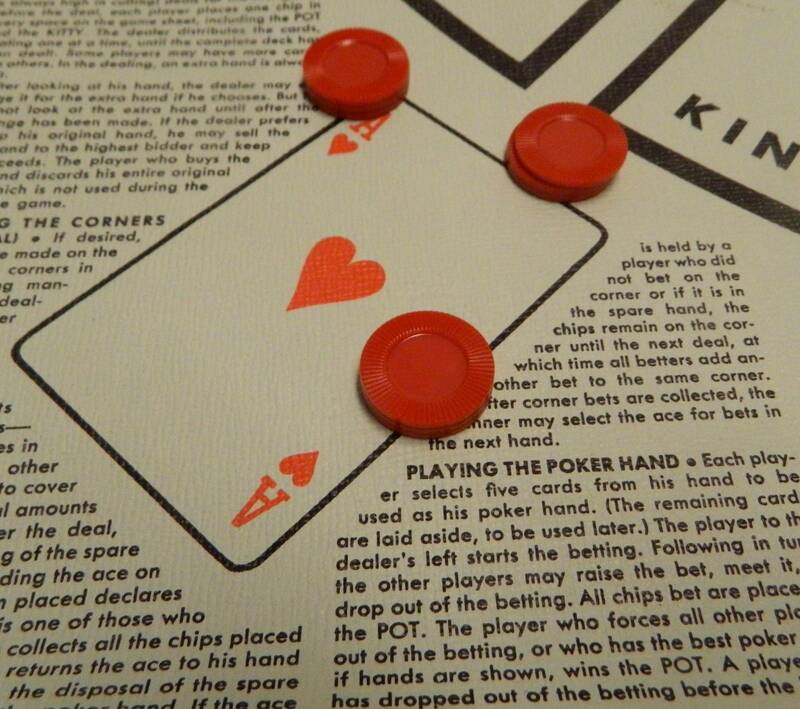 All of the players will then add one chip to each space on the gameboard including the Kitty and Pot space. The cards are then shuffled. All of the cards are dealt out to the players with the addition of one hand that none of the players control. 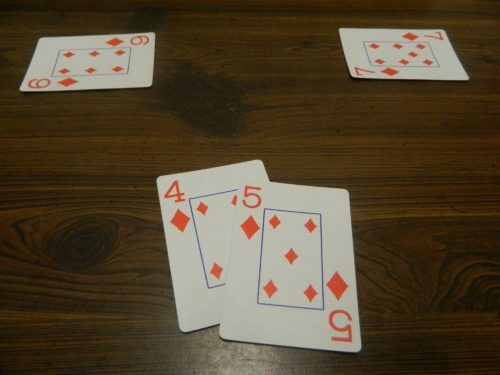 After looking at their hand the dealer decides whether they want to keep their current hand or if they would like to exchange it for the hand not belonging to one of the other players. If the dealer chooses to swap their hand, their old hand is set to the side for the rest of the round. If the dealer chooses to keep their original hand they can sell the hand that doesn’t belong to any player to another player. The player who bids the highest gets to swap their old hand for the new hand and pay their bid to the dealer. The players will then play the other two games that make up a round. The dealer can choose to bet on one of the corner aces. By betting the player thinks that the corresponding card was dealt to them. The rest of the players can choose to match the bet if they think they have the card. When players first look at their hands, the players see if they have the card. If one of the players who bet has the card in their hand, they get to take all of the chips placed on the space. If none of the players who bet control the card, the chips bet stay on the space for the next round. In the next round the players who bid in the last round will add to their bet. Three players have decided to bet that they have the ace of hearts. If one of these players hold the card they will win all six chips. Each player will select five of the cards from their hand in order to form a Poker hand. As most people are familiar with Poker, I am not going to outline how to play it here. Players take turns betting on whether they have the best Poker hand. All bets are placed in the POT space. When bidding players have to either call (match the previous high bid), raise, or fold (don’t bid). If all but one player folds, the last remaining player takes the POT. If there are two or more players who bid the same, players compare their hands to see who wins the POT. For the Rummy round the players will use all of the cards that are dealt to them. The player who won the poker hand will start. The player will play their lowest card (in some versions their lowest black card). Players will then build upon the card by playing the next card numerically of the same suit. This continues until a card is reached that none of the players have in their hand. This set began with the four of diamonds. The same player would play the five of diamonds. The player on the left plays the six of diamonds and the player on the right plays the seven of diamonds. None of the players have the eight of diamonds. The player who played the seven will start the next set of cards by playing a black card. The last player to play a card will then play their lowest card of one of the suits of the opposite color of the last set of cards. 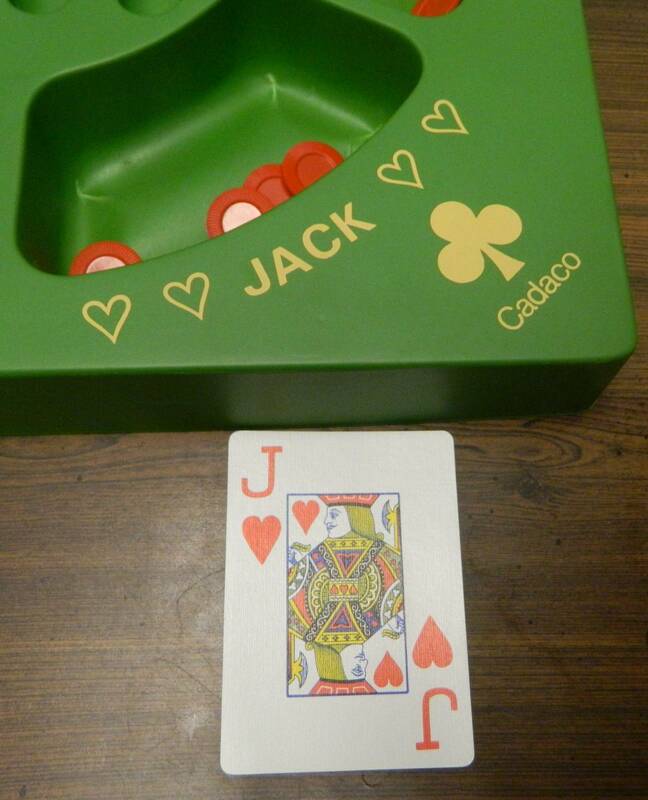 For example if the last set of cards were hearts, the player has to start with clubs or spades. If a player doesn’t have a card of the opposite color, the next player clockwise gets the opportunity to start. If none of the players have the opposite color, all of the players must put one chip for each card they have in their hand into the Kitty. The other color is then played. While playing cards if one of the players plays a card or card combination that matches one of the spaces, they get to take all of the chips on that space. To win the chips on the 6-7-8 space the player has to play all three cards consecutively. Chips not won during the round stay in place for the next round. This player has played the Jack of Hearts so they get to take the corresponding chips from the gameboard. The first player to get rid of all of their cards wins. They take all of the chips in the Kitty. The losing players will also give the winner one chip for each card left in their hand. This player has four cards left so they will have to pay the winner four chips. The players play as many rounds as they want. After all of the desired rounds have been played if there are still chips on the board the players will cut the deck to determine who takes the chips. The player who draws the highest and lowest card will split the chips on the board. The players count up their chips. The player with the most chips wins the game. Before getting into my thoughts on the game as a whole I wanted to quickly discuss the few differences that there are between the three games. When I played the game I technically played Rummy Royal but I also had a copy of Tripoley laying around so I decided to compare the two games to see what differences there were between the games. 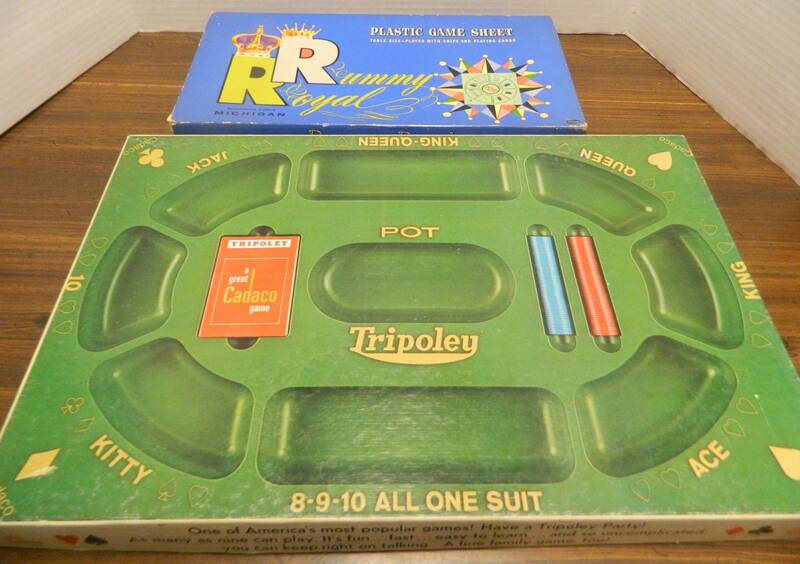 The biggest difference between Rummy Royal and Tripoley is that Tripoley does not have the “Play the Corners” game. As I will address soon this doesn’t really matter as that game is pretty stupid in my opinion. The other major difference is that the 6-7-8 space from Rummy Royal is replaced with a 8-9-10 space in Tripoley. In Tripoley you also don’t have to change between red and black for each set as you only have to change the suit from the previous set of cards. Finally Tripoley has a variant rule where the players can bid to choose the suits of the spaces on the board. When you look at these differences you quickly realize that Rummy Royal, Tripoley and Michigan Rummy for the most part are basically the same game. The few differences between the three games are minor as with a few modifications you could use any of the rules with any of the games. If you enjoy the game I see no reason why you would need to own more than one copy of the games. So let’s get to my thoughts on the game itself. I have to be honest and say that I don’t understand why the games are as popular as they are. The game doesn’t have great ratings but with how many copies of the game you run into at thrift stores and rummage sales it must have been really popular at some point. With the game being quite old (1937) I think its popularity comes from it being a game that was better than most of the other games created around the same time period. People had fond memories of the game from their childhood which has fueled the games’ popularity. Unfortunately I don’t think the game has aged well. The biggest problem with the games is that they basically rely entirely on luck. There are a couple decisions you have to make in the game but how well you do in the game is going to depend on what cards you are dealt. If you are dealt bad cards you have no chance of winning the game. At times the games just feel like you are betting on a bunch of random stuff that you have no control over. This leads to the games feeling like a completely random experience. To break down Rummy Royal, Tripoley and Michigan Rummy I think it is best to look at the three different types of games. First I will start with the Play the Corners round. I will be blunt, I do not understand the point of even playing this round. Since players can’t look at the cards they are dealt, players are just randomly betting on whether they were dealt the card. If you feel that you were dealt the card you can bet but otherwise you shouldn’t bet. That is all there is to the game. This is a pretty stupid mechanic as it relies entirely on luck. It ends up becoming a very basic gambling mechanic as there is no way to know if you have the card. I personally would recommend just ignoring this round entirely. Next comes the Poker round. The Poker round is just your typical hand of Poker. If you like Poker you will enjoy it. If you don’t really care for Poker, I don’t see why you would like Poker in Rummy Royal/Tripoley/Michigan Rummy. As everyone probably already has their own opinion on Poker I don’t see the point of really talking about it. The final and most substantial mechanic in the games is the Rummy round. In some of the games this is broken into two different rounds. In one round players take chips from the spots on the board corresponding to the cards in their hand and in the other round players play cards in numerical order. Personally I found the Rummy round to be decent but nothing special. Basically if you are looking for something to play that you don’t have to put much thought into, it works fine for that purpose. If you actually want a mechanic that has some strategy though, it is not going to be for you. The problem with the mechanic is that it seems to rely almost entirely on luck as your success is going to depend on what cards you are dealt. There isn’t a lot of strategy as you have little control over what cards get played. The only decision you get to make is what suit you are going to start with since you have to play the lowest card from that suit. Then players just play the next card numerically in the suit. I see the winner of most of these rounds almost being predetermined by how the cards are dealt out. The most disappointing part about this mechanic is that I think it would have been more enjoyable if there was more decision making. If there were more options in choosing which card to start with I could actually see some strategy. Being forced to play your lowest card from one of two suits doesn’t give you much of a decision. Being able to choose from three suits in Tripoley improves things a little but there are still few decisions in the game. I wonder if being able to play any card to start with would add more strategy to the game. Without adding some house rules can someone tell me if there is any strategy to the Rummy portion of the game? Unless my group was just unlucky I would also like to know if it is normal for one or more of the players to lose all of their chips really quickly. Unless the players equally split the chips that are won, one or more players are going to lose a lot of chips every round. Within just a couple rounds several players in the game I played had already run out of chips. I think this is because two players seemed to win almost all of the chips. In one Rummy round one of the players wasn’t even able to play one of their cards before the round ended. This lead to the player losing a lot of chips. Unless you give all of the players a lot of chips at the beginning of the game, it is likely that some of the players won’t last that long. Component wise it is kind of hard to say a whole lot about the components since there have been so many different versions of the games created over the years. What all of the versions share in common is that they either come with a mat/gameboard, some chips and a deck of cards. Some people seem to prefer the mats while other people prefer the boards. For their age the component quality is not terrible but I wouldn’t say they are great either. The biggest problem that I had with the components is that it is debatable whether you really need them. Mostly you just need a standard deck of playing cards and some chips. For the gameboard you don’t really even need it or you could easily make your own. Should You Buy Rummy Royal, Tripoley or Michigan Rummy? 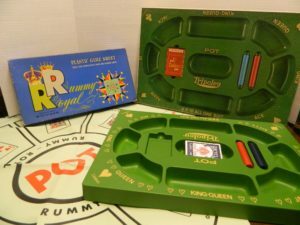 While Rummy Royal has been pretty popular in the past, I have to admit that I wasn’t impressed. Basically Rummy Royal, Tripoley, and Michigan Rummy are a collection of three different games. Basically all three games are pretty typical card games. The biggest problem that I had with the game is that the games rely almost entirely on luck. There are few decisions to make in the games (outside of betting in Poker) which leads the games to feel like you are randomly betting on different things to happen. The Rummy round could have been interesting but since you are limited on what cards you can start a set of cards with, there isn’t much decision making. Basically Rummy Royal, Tripoley and Michigan Rummy are not terrible games but they only work if you are looking for a game that you can play where you have to put little thought into what you are doing. If you don’t really like traditional card games, I don’t think you will like Rummy Royal, Tripoley or Michigan Rummy. I think the only people who will enjoy the game are people who have fond memories of the game and people that are looking for a simple card game that you can play while turning off your brain. Which version of the game you should purchase doesn’t really matter as all three are basically the same. You probably should either pick up the game that you have the most memories of or whichever one is cheapest. I researched a 1981 rendition of Rummy Royal and think I can add some perspective. If you play the game exactly as prescribed, your assessment of the skill factor is correct. There is none. The corner aces opening salvo is basically a four-reel slot machine that pays out on a specific cherry. Phase two Five Card Stud poker has no skill either unless wagering intimidation counts. As for the last Rummy phase, suffice it to say, I’d call it Rummy-By-Number. Maybe Robot Rummy. So yeah, as is there’s no strategy once the poorly written instructions have been deciphered. But I’m not sure it’s so much the game’s fault. I think the key is to recognize it for what it is, which is a gambling game for people fond of poker and rummy. Those who want to play poker or rummy should go play poker or rummy. This is more like something you’d find in a speakeasy. It’s an ideal game to play with pennies instead of chips and have a genuinely fabulous time for hours. As a bonus, it’s simple enough to play with a whiskey-marinated brain too, so even the likes of Donald Trump could play (with a little help, still, and someone to explain to him what a penny is two or three times, very slowly). But again, the single dimensionalism of the game is only observed if you play the game as prescribed. It can become engaging if you do what most people do, which is not require play to begin and succeed with lowest black card restrictions. Players can establish a measure of control over how and when others players get rid of their cards when they can choose which suits and values with which to lead. It’s literally a game changer, and the gambling gets sweeter too with infusion of strategy. But to me this is just a gambling game and probably shouldn’t even have the word “Rummy” in the name. Generally when I review games I go based on the printed rules and occasionally implement some variant rules that are included in the rules. With how popular Rummy Royal is your house rules along with other house rules that have been developed over the years probably make the game quite a bit better. I can totally see why people enjoy these type of games. I am not a huge fan of gambling and these type of card games so Rummy Royal wasn’t really made for me. If you want a simple gambling game though I could see people enjoying Rummy Royal. Works well as a game that you don't have to put a lot of thought into. Easy to pick up and play. Relies almost entirely on luck with little decision making. Basically consists of three basic card games.